The index opened positive above 8400 and went on to make high of 8445.60. Profit booking from thereon moved the index back below 8400 to close near the lows at 8378.40, loss of 17.05 points. The broader market though was flat, with 768 advances to 762 declines. 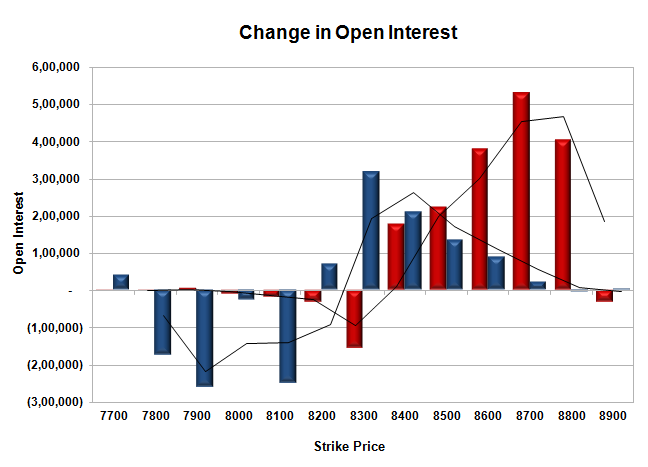 The Larger Range as per OI Table remains at 8000-8700. Call option 8400-8800 added huge 17.15 lacs OI with short covering seen at 8300 and below strike prices. Put option 8600-8200 added huge 8.22 lacs OI with profit booking seen at 8100 and lower strike prices. Nifty Open Interest is at 2,06,98,500 down by 7,29,425, with decrease in price, most probably huge long liquidation. 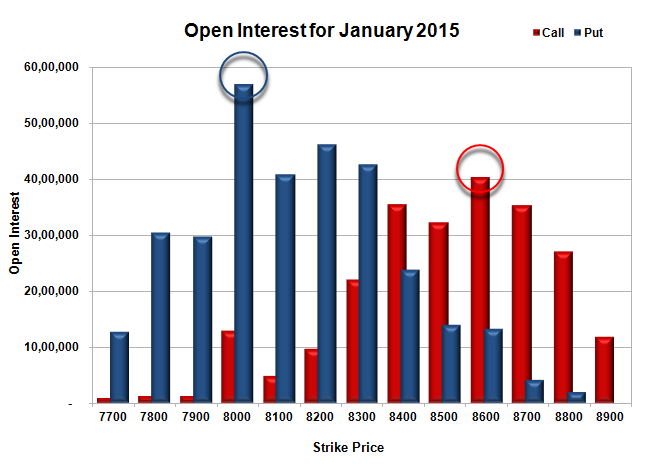 Bank Nifty Open Interest is at 20,13,850 up by 3,275, with decrease in price, most probably small short build-up. FII’s sold huge 6.88 lacs Futures, which includes 26806 contracts long liquidation and 721 contracts short build-up, with decrease in net OI by 26085 contracts (includes 27240 longs to 54767 shorts for the day) and the Average Price comes to 8675.52. FII’s Index future open contract as on date is 595979 Longs to 80701 Shorts, net long 515278 down by huge 27527 contracts. Initial support at 8300, with huge OI of 42.73 lacs for the day and below that at 8200 with OI of 46.27 lacs. Initial resistance at 8500, with OI of 32.31 lacs and above that at 8600 with OI of 40.41 lacs. 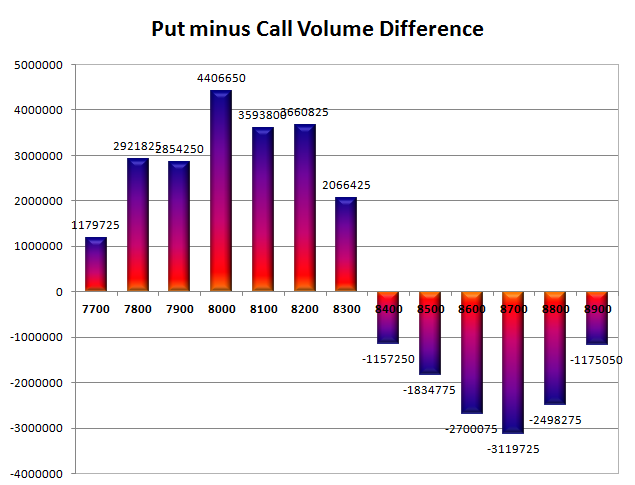 Day Range as per Option Table is 8328 - 8456 and as per VIX is 8316 - 8440 with 8396 as the Pivot.